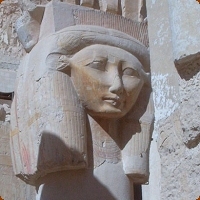 Only a few women ruled ancient Egypt as Pharaohs, and among them the most important was Queen Hatshepsut of the `New Kingdom,' which had such great pharaohs as Amenhotep, Thutmose and Tutankhamun. Her rule (1473-1458 B.C.) saw the construction of magnificent temples dedicated to ancient Egyptian gods and goddesses. The dynasty was noted for its magnificent temples at Karnak, Luxor and, later, at Abu Simbel. 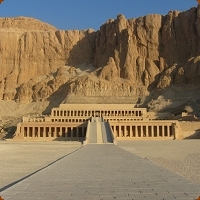 Queen Hatshepsut carried on the tradition of temple constructions and embellished them with immense contributions. The name in Arabic is Deir el Bahri, meaning "Monastery of the North" and called by the ancient Egyptians Djeseru-Djeseru, "Holy of Holies" or "sacred of sacreds". Hatshepsut’s terraced and rock-cut temple is one of the most impressive monuments of the west bank. The queen's architect, Senenmut, designed it and set it at the head of a valley overshadowed by the Peak of the Thebes, the "Lover of Silence," where lived the goddess who presided over the necropolis. The terraced design of her temple copies and elaborates upon the design of the earlier temple to the left, belonging to Mentuhotep Nebhepetra, who founded the Middle Kingdom (c. 2060-1785 B.C.). The approach to the temple was along a 121-foot wide, causeway, sphinx-lined, that led from the valley to the pylons. This avenue was once tree-lined and the remains of the fossilised incense tree stumps, brought back from Punt, can still be seen. The axial plan provided symmetry. It consisted of three broad courts separated by colonnades. These terraces were linked by ascending ramps, and bounded by dressed limestone walls. 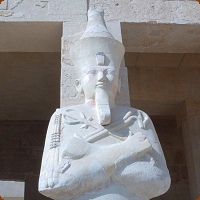 At the southern end of the second colonnade is a chapel to Hathor chapel. 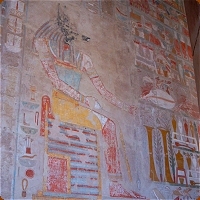 The chapel contains a vestibule with the characteristic Hathor-headed pillars, a 12-columned hypostyle hall and inner rooms also decorated with various scenes of Hatshepsut and Hathor. At the northern end of the same colonnade is a somewhat smaller chapel of Anubis, again with a 12-columned hall and inner rooms. The sanctuary and shrine were cut deep into the red sandstone cliff like the rock-cut tombs of the Middle Kingdom. The sanctuary on the highest level of the complex contained a solar cult chapel and a shrine for the royal cult.